Novice swimming is the basic level learn to swim class at De Anza College in Cupertino. As of 2019, enrollment fees for classes are $31 per unit ($15.50 for this one-half unit class). I teach novice swimming on Saturdays fall, spring and summer quarters. Spring quarter I usually teach two novice swim classes 10 a.m. to 11:50 or noon to 1:50 Saturdays. If you enroll in one of my weekend classes, please have your swimsuit, towel, swim cap, etc. and be ready to be in the water the first day of class. How can I register for the class? then find KNES001A and my name, Mary Donahue. 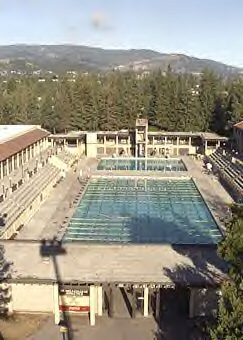 De Anza swim classes often fill early and have a waitlist. My classes often have a long waitlist, but just as frequently we have people who are enrolled who do not attend the first day and then we take people from the waitlist. You must attend the first class, with swimsuit/towel, sunscreen, cap if you want one, ready to get in the water. There are no prerequisites for these adult swimming lessons except to be able to register as a De Anza student. The class is held in 4 to 5 foot deep water, so you need to be tall enough to have your head above water that is 4 or 4 1/2 feet deep. A swimsuit you can move in. For women a one piece suit is preferred; not strapless. For men: real swim trunks, not extreme bikini style or cut-off jeans. Most of the time we get into the pool the first class session, so plan ahead and bring your swimsuit. I really recommend a swim cap for my novice students as it will make it easier to learn to swim. Without a cap water just drips annoyingly into your face every time you go under and stand up. With a cap it sheets cleanly off of your head. A cap also keeps hair out of your eyes. Cloth/lycra types will keep your hair in place more comfortably than latex/silicone, but cloth caps don’t stay on as well as latex/silicone. Don’t try to fit all of your long hair into the cap, just tie back or braid it and use the cap over the hair on your head. You can find many styles of caps at most sporting good stores. Chlorine in the water can hurt your gold jewelry and if you chip a stone off a ring we will never find it in the pool. The water is warm enough for senior citizens exercise classes. Where are the De Anza College swimming pools? Novice swim meets at the shallow (east) end of the big pool. De Anza requires a minimum of 20 students per class, but we usually have many more students. I recruit former novice students to help with the class. The teaching assistants and I can teach / coach various small and large groups of swim students based on their skills each day. The teaching assistants and I teach from in the pool, not up on the deck. The first time people try to float or swim in deep water there will be a coach, often a lifeguard in the water with a rescue tube next to the swimmer. No, this is not one of those classes where people are ever pushed into deep water. Do I have to take a written exam or write a term paper? Because this class fulfills part of the general education requirements, a final exam and a short paper are required by the college (in all Kinesiology (P.E.) classes). What do students think about this class? If you are new to swimming you could learn a lot from swimming vocabulary.